Support Texas Woman's University soccer program. The sprint triathlon will also include a team competition for the sixth year in a row. The team competition will consist of three divisions – male, female, and coed. This is not a relay, as each team member will do all three components of the sprint tri. The overall race times of the three team members will be added together to determine a final team time. The team with the lowest total time in their division will win team trophies. Racers that participate on a team are still eligible for overall and age group awards. The 5K is open to both runners and walkers and will start at 7:30 a.m. Overall and age group awards will also be given out for the 5K. Dallas Athletes Racing will produce the 2018 Pioneer Power Sprint Triathlon & 5K. 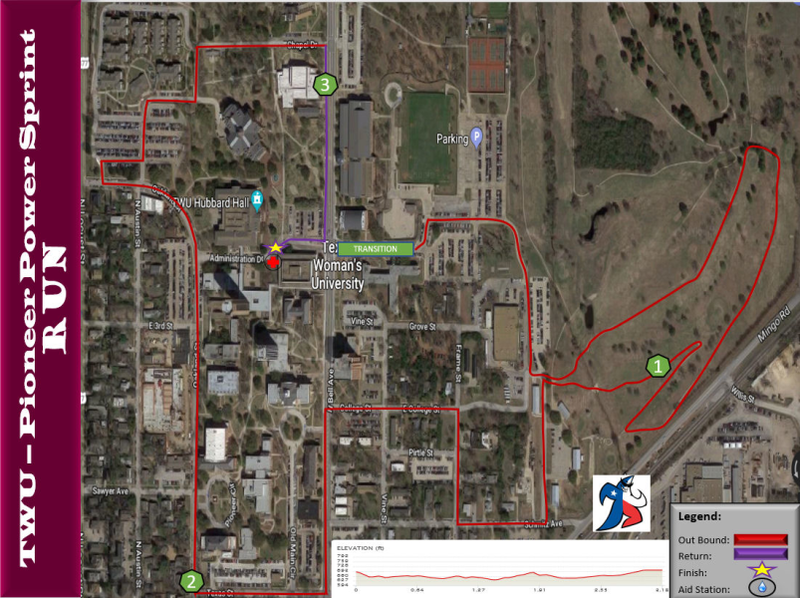 Multi sport enthusiasts in the North Texas area will recognize Dallas Athletes as the company responsible for highly regarded local events such as the St. Patrick's Day, Caveman, TexasMan, Disco, and Monster triathlons. 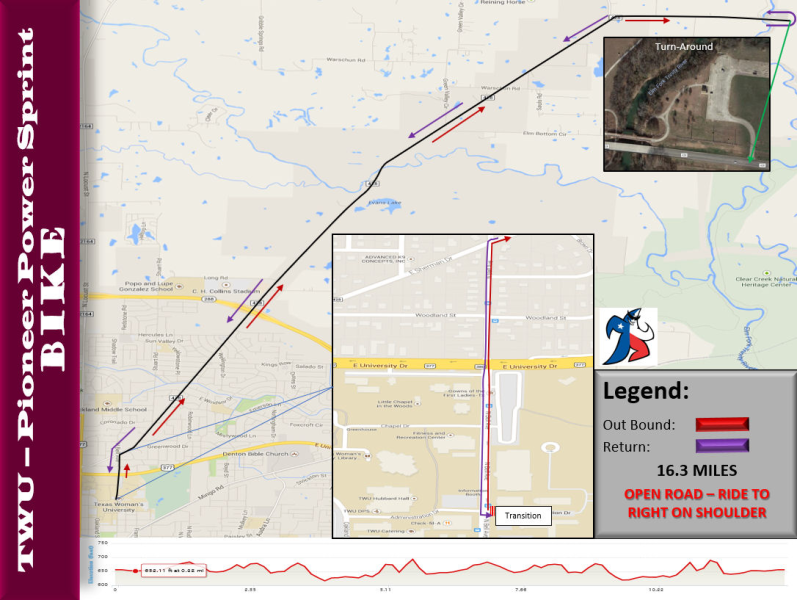 The 5k only event distance is 3.1 miles. Over 3,600 athletes have participated in the first 11 editions of the Pioneer Power Sprint. Profits from the 2018 Pioneer Power Sprint Triathlon & 5K will benefit the TWU soccer team. Competitors in the 2018 Pioneer Power Sprint Triathlon will receive a tech shirt and performance socks. All triathlon finishers will receive a finisher’s medal. You must have a valid photo ID to pick up your packet. NO EXCEPTIONS! Only you can pick up your packet unless the participant is a minor. Register online prior to picking up your packet. If you do not have a current USAT license, you will be required to register for a one day pass or purchase a one year license during the registration process. Residents of Fort Worth may pick up their packets race morning in Pioneer Hall. 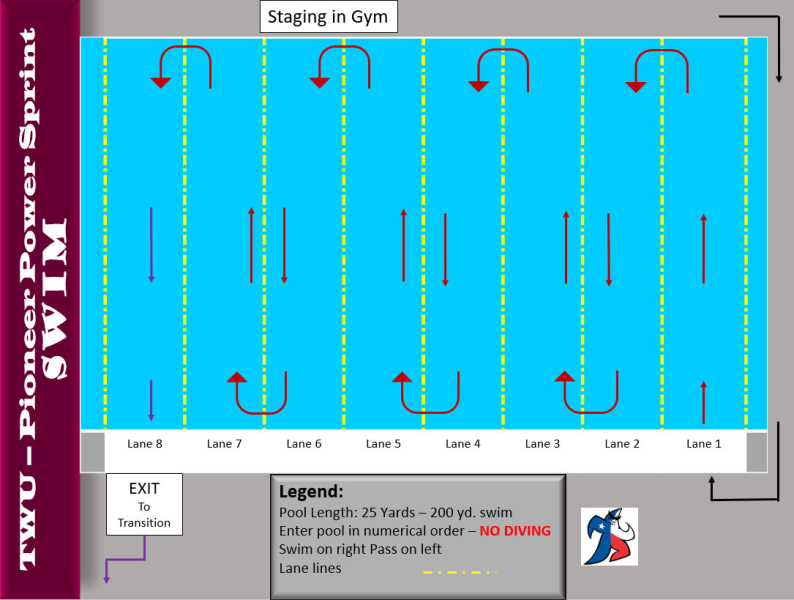 The swim portion is a 200 yard distance. Please line up according to your race number. The Bike distance is 16.3 miles. The run distance is 3.1 miles (5k). 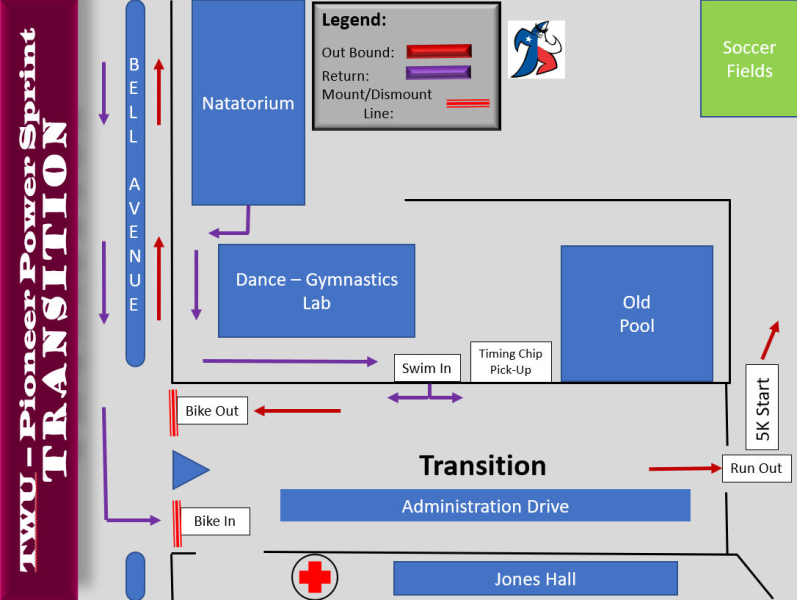 This map is for both the Triathlon and 5k events. Make your race morning THE BEST after a GREAT night's rest at our host hotel the Embassy Suites Denton. Special rates for participants and family. See link for details! Check out the 2018 race photos!